We all know that if we want to produce outstanding results and produce amazing success in our field, we have to be consistent with what we do. Just like professional athletes, they train every day regardless of whether they like it or not. It is the process that we should focus on, not the performance. Yes, it is what we do each day and consistently that counts. It is what we do every day that will shape our lives and determine our future. What we do every day is more important than what we do once in a while. There’s no way you can lose weight by just going to the gym for once. You cannot build a great blog by just publishing one article. It requires consistent effort, day in and day out. And because success is a long-term process, most people would give up long before they see the results. Ask yourself this question, right now, can you endure and be consistent with what you do for a year? Or maybe two, three or five years? If you can persist and keep on working on the process, you will eventually become the master in what you do. And by that time, you will become successful. People will regard you as ‘the best’ in your field. Luckily, Jerry Seinfeld has developed a simple and yet powerful method that anyone can use and leverage on to be consistent with their work. If you look it up on Wikipedia, Jerry Seinfeld is an American comedian, actor, writer, producer and director who is best known for portraying a semifictional version of himself in the sitcom Seinfeld, which he created and wrote with Larry David. According to Forbes magazine, Seinfeld’s annual earning from Seinfeld in 2004 was $267 million, placing him at the top of the celebrity “money rank” that year. Not only that, between June 2008 and June 2009, Seinfeld earned $85 million, making him the world’s highest-paid comedian during that 12-month period. So what makes Jerry Seinfeld so successful? There is a method; a strategy that he used to catapult his success throughout his career as a comedian. And this technique is what we called, “The Jerry Seinfeld Calendar Method”. It is a simple and effective technique to get people to follow through and be consistent in their day-to-day work. If you want to turn a productive action into a habit or if there is any action that you want to be consistent with, all you need to do is to apply this technique to it. Get yourself a calendar, and every day whenever you have performed the task, put a big red “X” on that day on the calendar. And your mission is to keep the big red “X” chain going without breaking. For Jerry Seinfeld case, he said that the better way for a comedian to create better jokes is to write the jokes each day. So every day, he will write a joke. No matter it is a good one or a lousy one, Jerry Seinfeld focused on the process and continued to write a joke a day. And whenever he got the task done, he would put a big red “X” on his calendar. This process continues on and on, days, weeks, months, and years. Jerry Seinfeld eventually becomes better and better at his jokes. This is how he improves his skills and becoming the best in what he does. The key is to focus on the process and not the results. Whether he writes a good joke or a bad one does not matter. All that matter is to be consistent in building the habit. And as time goes by, he becomes better at it. You can apply this simple and powerful consistency to improving your skills and greatly enhance your success in life as well. There are a few things that you need to know about this method. First, it is a very powerful technique because it is easy to implement and simple to do. You don’t have to buy download any App and then spend an hour learning how to use it. You can just get a calendar and start doing it. Second, it is something that you can measure. When you can measure, you can improve. 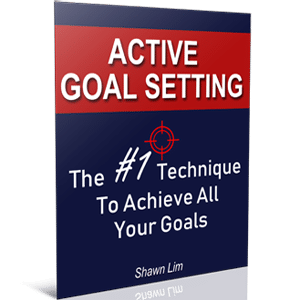 A lot of people fail to achieve their goals because they don’t have a scoreboard. And the calendar you use can act as your scoreboard. And whenever you see the long chain, you will feel satisfy because you know you are making progress and moving forward. And finally, the most important of all is that whenever you see the calendar, you will remind yourself of what you have to do. If you are yet to put the big red “X” on the date, you know what to do. Do you know that majority people who fail to achieve their goals are because they forget about their goals? They thought that all they need to do is to write down their goals once and then they’re done. Wrong, if you never remind yourself about your goals and what you want to achieve in your life, you will never act on them. You will get distracted and forgot about what you need to get done. By the time you remembered that you need to write a blog post or do 20 pushups, it will be too late. You will never have the energy or the motivation to do it anymore because you have used up most of your willpower on other things. This is how the Jerry Seinfeld Calendar method is effective and how it can help you in reaching your goals. For myself, I choose to implement this technique with my writing. Every day, I commit to writing 1,000 words of content for this blog. And whenever I have got this task done, I will put a big red “X” on my calendar. So far, I have never missed a day. Weekdays are good because I can stick to my schedule and write at least 1,000 words. However, on weekend, it will be more challenging. I try to write 1,000 words once I get up in the weekend. 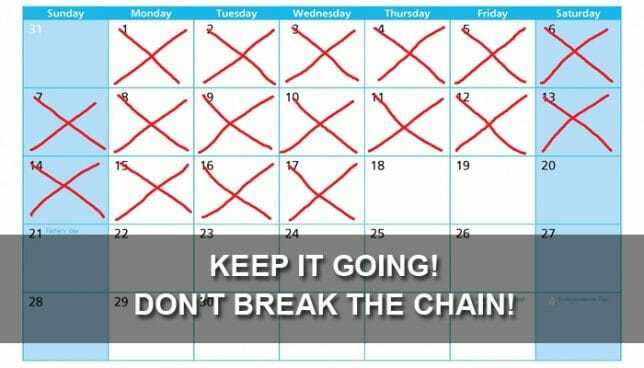 I don’t want to break the chain and so I choose to do it early in the morning so that there’s no distraction and I can make sure I get it done. This Jerry Seinfeld “don’t break the chain” strategy can be easy to implement, but there are a few things you need to be aware on. The task that you choose or the action that you want to grow as your habit must be something easy to do. Well, remember that you will have to do it every day right? So if you choose a heavy task such as writing 5,000 words a day, you will suffer burnout and quit faster than you imagine. It is not sustainable. The same goes for working out in the gym. If choose your task as to workout heavily in the gym for 2 hours a day, it may be a challenging task. Instead, choose something simple and you can sustain doing for long-term. Writing 1,000 words content is a good start for bloggers or writers. Doing 20 pushups can be a good choice too if you want to get fit. If you want to get fit, exercise for 15 minutes each day is a good way, but it will never work if you choose to do research or read books on fitness. You must choose a task that will give you result. If you want to build a successful blog, writing 1,000 words a day can be a good method, but if you choose to study other blogs, read or learn, you may not get the result you want. So choose your action wisely. Choose to do something that will yield you the result you want when you practice it over the long-term. There you have it, the Jerry Seinfeld Calendar method that anyone can leverage to be consistent in what they do. Do you notice that you have learned something easy to implement and yet it is effective and powerful? Get a calendar now and put it somewhere you can see often. And then decide on the action that you want to be consistent in. Whether it is writing a 1,000-word article, doing 30 pushups, exercise for 15 minutes, drinking 500ml water upon waking, or jog for 5 miles a day, you can use this method to stay consistent each day. Apply this technique and see how easy it is to keep track of your progress. By the way, let me know how you plan to use this technique. Do share with me your opinion in the comment section below. Shawn, I was not aware of the Jerry Seinfeld method, but reacing your blog outlining it, it is a terrific help. Several years ago, I started writing Devotional’s based on some portion of scripture from the Bible. Although I do not have a visible calendar, I have a daily record of these Devotional thoughts. In addition, I have branched out to involve the assistance of a friend who has helped to do some research for me, and he is in a federal prison. This is good for him and keeps his mind active and where it needs to be. I correspond with him weekly, and right now our project is finding a verse of scripture according to the month and day – January, the 1st month, and 1, the 1st day, found the scripture in Genesis 1:1. He has helped me locate verses all the way through the end of December. I plan to share this method with another friend who is trying to overcome some personal issues. Having this subtle reminder on his calendar will be a great help. Thanks for your input. I look forward to more information from you and those 1,000 words you write each day. Hi Chuck, glad that this technique helped you.